I was in Quashnet Forest yesterday, and I can report that the cicadas were quite noisy still. I saved one from imminent death by drowning as I was paddling around a pond (see photo). 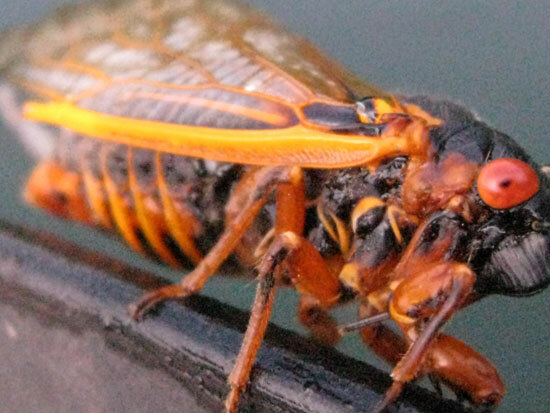 Glad to hear that the cicadas are still going strong. To be honest, I'm quite surprised, I thought they'd be gone by now. Thanks for the update! Cicada teneral in West Boylston Ma. Cicada Sighting in Falmouth, Ma. Brood XIV Straggler from Marston Mills, Ma. Tibicen australis in Alva, FL. T. canicularis in Taunton, Ma. Tibicen canicularis cicadas in Adams, MA. Smashed Tibicen canicularis from Woburn, Ma. T. pruinosus from Dardenne Prairie, MO. T. tibicen at Dardenne Prarie, MO. Mating and Ovipositing Cicadas Dardenne Prairie, MO. Brood XIX Pittsboro Area, N.C.
Brood XIII Magicicada in Chicago, IL. Cicada Images from Concord, MA. Cicada Sighting in Wellfleet, Ma. Cicada Sighting - Shrewsbury, MA. Cicada Sighting - Marlborough, MA.